Throughout our entire lives, our brains can adapt, change and grow. Regardless of age, our brains are capable of finding new and better ways to reorganize neural connections and even create new ones. These neural connections form the foundation of our cognitive skills. 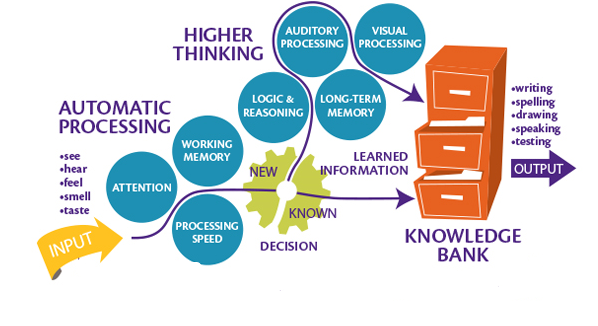 Cognitive skills are the core brain skills that make up IQ and determine how well we think, read, learn, reason, remember and pay attention. Brain abilities and performance are never “set in stone.” Because the brain is always adapting and building, our ability to think, remember and learn is never static—it can always be upgraded and improved! The brain’s ability to adapt and grow is called “neuroplasticity.” Neuroplasticity is the science behind brain training and the basis of the BrainRx brain training program. Whether you’re reading a book, studying for a test, chatting with a friend or even driving a car, your brain is bombarded with information from all five of your senses. All this incoming information is processed through a set of core cognitive skills. Like cogwheels in a machine, these skills work together to move information into stored knowledge so you can access it later when you need it. Because these skills work together, if even one skill isn’t pulling its weight, it can keep your brain from fully grasping and processing incoming information. This, in turn, creates frustrating challenges in school, work, and life. BrainRx programs use intense mental exercise to strengthen key skills. Training takes place in our centers, using a unique combination of one-on-one brain training and digital training. Even though the training is fun and incorporates a variety of game-like exercises, it’s intense and effective. Pre-training testing allows us to identify specific weak skills so we can target those skills and strengthen them. Finally, by working with their own personal BrainRx trainer, students get the benefits of customized sessions, accountability, and lots of one-on-one encouragement. Want to open a BrainRx Center in your city? Get licensing information here. BrainRx Brain Training programs are only available outside of the United States. If you are looking for help and you live in the United States, visit www.learningrx.com. LearningRx is the parent company of BrainRx.